I love the Holidays and in our home, the Holidays extend into January when Grandma and Grandpa visit before heading south for the winter. This year, because of the extreme cold they extended their stay by a couple of days. We will miss Grandma & Grandpa but it will be nice to get back to a regular routine. I just have to share that when Grandma is around, I'm pretty much "chop-liver" and this time, Grandpa was also highly sought out by our little man, Caleb! Last night Grandma and Grandpa said goodbye and told Caleb that they would be gone when he awoke in the morning. Caleb has some developmental delays, and I was worried this morning would be tough with Grandma and Grandpa gone. So, this morning, he peeks into the guest bedroom and saw that they were not there then totally surprised me by coming into Mommy & Daddy's room so happy to see me. So, now that Grandma and Grandpa are on their way south to Navarre, Florida, it is time for this mommy to get back to the craft room and the business of Stampin' Up! It seems that I don't get nearly as much done in the Craft Room and with my Stampin' Up! business when Grandma & Grandpa come for a visit so now I have a TON of work to do along with catching up with my crafting. To kick start the new Year, I'm starting with my blog post today sharing with you my Design Team card for the Paper Craft Crew Card Sketch #75. The other big news is that the Stampin' Up! Occasions Catalog has arrived… As of January 3, 2014, you can now order from the Occasions Catalog. To place an order, Click HERE! The card I made features lots of new product from the Stampin' Up! Occasions Catalog. I absolutely love the watercolor look and Stampin' Up! has made it easy for YOU to get this look with the new Happy Watercolor Stamp Set. This card starts with a card base of Whisper White cardstock. The first layer is Crushed Curry cardstock layered with Watercolor Wonder Designer Series Paper which is an awesome new Designer Series Paper found in the Stampin' Up! Spring Catalog. I stamped the "You Make Me Happy" sentiment from the Happy Watercolor Stamp Set in the bottom right corner. Next, I worked on my stamping and the elements of the card. The first element is the Banner created with the Banners Framelits dies. I'm totally in LOVE with this Framelit. To create the layered banner, I used the second largest Banner Framelit to cut out the Coastal Cabana cardstock. On Whisper White cardstock, I stamped the background with Daffodil Delight and Crisp Cantaloupe then the single flower was stamped over the background using Tangerine Tango classic ink. Next, I cut out the stamped image using the third largest Banner Framelit and layered that over the Coastal Cabana Banner then cut the excess cardstock off the top of the Coastal Cabana so the stamped image was flush with the top edge as well. Behind the Banner, I layered Crushed Curry cardstock which was cut out using the Top Note Bigz Die and only a small piece cut off from the short end of the Top Note Bigz Die. 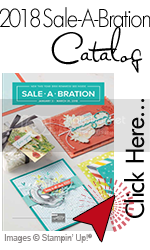 One of the finishing elements to this fun, soft and feminine card features a sneak peek of Sale-A-Bration product with the cork flower which is from the Sweet Sorbet Accessory Pack. I also layered the Gumball Green leaves cut with the Secrety Garden Framelits behind the cork flower. Then I topped off the card by adding a small Vintage Faceted Designer Button tied with Whisper White Baker's Twine. This card really does make me happy! Here is this weeks Card Sketch #75 from the Paper Craft Crew! We would LOVE to have you come play along this week and share your creation. This is a fun sketch… Well, OK, I'm biased and think all the sketches are great but this is one of my favorite sketches. Don't forget to share the sketch and design team cards on Pinterest! To view submission from other members of the Design Team, click HERE for the Paper Craft Crew Blog.